Desktop Style Antennas for use with data cards and modems. Antennas for Mobile and Kiosk applications. The WM8 range is housed in impact resistant, UV stabilized and flame retardant plastic. 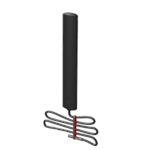 The antenna is sealed to be weatherproof and features a heavy duty N female connector making it ideal for indoor and outdoor deployment. Panorama WMM8G-7-27-5SP Mimo antenna. True Mimo two cable setup. Antenna comes complete with two 16' Cables terminated in SMA Male. ** BLACK IN COLOR ** The Panorama IN1957-B Great White Antenna Kit consists of antenna model LPMMB-7-27 along with two 16' cables, model C29SP-5SJ, which come with SMA Male connectors. Panorama WMMG-7-27-03NJ Mimo antenna. True Mimo two cable setup. Antenna comes complete with two 1' Cables terminated in N Female connectors. The Panorama LGMM low profile MIMO antenna range has been designed to support the new generation of vehicular LTE routers. The antenna enclosure contains five isolated high performance antenna elements; two ultra-wideband elements covering 698-2700MHz. Panorama WMM8G-7-27-5SP Mimo antenna. True Mimo two cable setup. Antenna comes complete with two 1' Cables terminated in N Female connectors. The Panorama IN1959-W Great White Antenna Kit consists of antenna model LGMM-7-27 along with two 16' cables, model C29SP-5SJ, and one 20' cable, model C74-FP-6-SMAP, which all come with SMA Male connectors. The Panorama IN1958-W Great White Antenna Kit consists of antenna model LGMM-7-27-24-58 along with four 16' cables, models C29SP-5SJ & C32SP-5SMARV, and one 20' cable, model C74-FP-6-SMAP, which come with SMA Male, RPSMA Male, SMA Female, and FME Male. Please note that this antenna is for modems with 3x MiMo (i.e. CalAmp Fusion) The Panorama LGMTM-7-27-24-58 low profile MIMO antenna for LTE, cellular, WiFi, WiMax, and GPS applications. Panorama Adaptor has a range of standard cable assemblies using SR1-029-B cable. The benefits of purchasing a standard cable is the reduced lead time because they are likely to be off the shelf and will be cheaper than a custom cable assembly. The TPD-BC3G-26 is a simple, portable data card antenna. This paddle style antenna is easily positioned on a notebook or laptop screen using a hook and loop pad. The connector is plugged directly into the mobile broadband data card, express card.